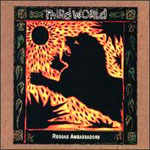 Only a couple of songs from Third World are worth hearing, and those are first class Reggae. All the rest is entertainment for tourists. Calling this compilation "Reggae Ambassadors" is pretentious and is like putting Michael Jackson on the same level of Curtis Mayfield. Nonsense. The story of Third World is partially linked with Inner Circle, infact some members shared both stages. As a matter of fact both bands always stayed on the edge of a crossover attidude and often crossing it to more soft commercial sounds. The compilation stars with great songs from early sets like the cover of the magnificent Abyssinians "Satta Massa Gana", "Brand New Beggar" and "1865 (96° In The Shade)". Someway their trademark for the world market was the funky of "Now That We Found Love". The first side closes with the vibes of "Uptown Rebel". The second side opens with a great live set: "Jah Glory". The other song to save is "Roots With Quality". As previously said the rest is too much soft for me. Commercial all-inclusive kind of journey. For some songs it is easy to imagine a happy fat tourist getting filled of Red Stripe under the shade by the hotel bar, feeling attractive since for a few days he is away from his daily job. Cho!